When your boss tells you to draw outside the lip line, you do it. Sometimes you have to be bad. Especially when your boss tells you to be bad. 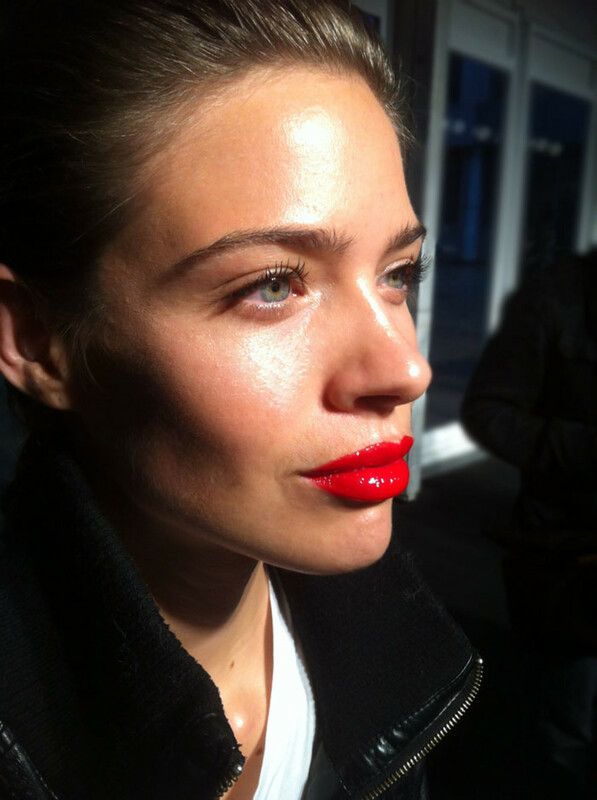 To get the high impact, Ã¼ber-glossy red lip for Evan Biddellâ€™s Spring 2013 show at World MasterCard Fashion Week, Maybelline New York makeup pro Grace Lee instructed the backstage artists to break what has to be the most unbreakable rule in makeup. Closed track. Professionals only. Do not attempt this at home. (But definitely try this trend -- just colour inside the lines. 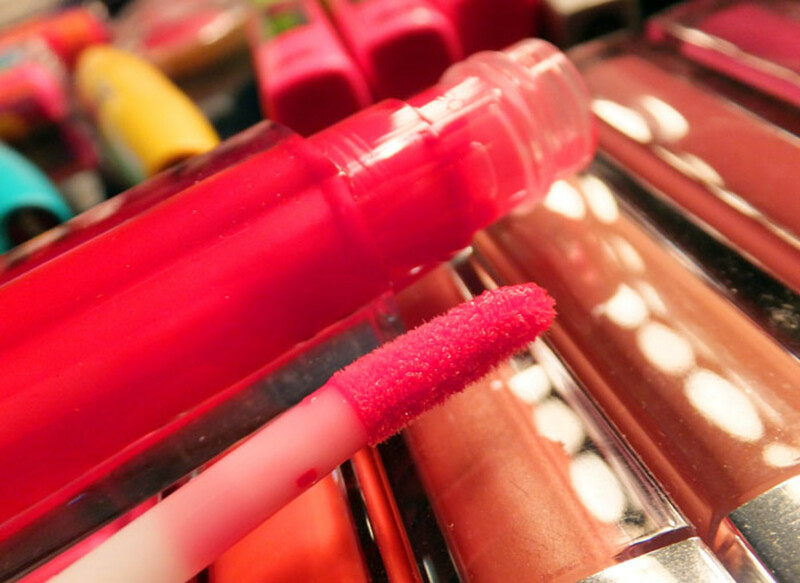 On the rule-breaking, larger-than-life lip, Lee painted lavish amounts of â€œMaybelline New York Ravishing Rouge 14 hour lipstick, because I knew how much gloss I was going to put on,â€ she explains gleefully. â€œAnd then we used the new [Color Sensational] High Shine Gloss ($9.99 at drugstores and mass retailers) in Gleaming Grenadine, layered right on top. And itâ€™s giving this powerful, super-glossy red mouth,â€ she concludes with immense satisfaction. Eyes got nothing more than â€œreally curled lashesâ€ augmented with Volum&apos; Express The Mega Plush Mascara, and natural brows held in place with clear mascara. The result on the runway was a dramatic attention-getter that balanced Biddellâ€™s graphic prints and high-shine separates, but also looked totally at home with the Model-Off-Duty backstage uniform of black leather biker jackets and skinny jeans. Proof that a red lip really is versatile and infinitely wearable. â€œI donâ€™t think a bold mouth is going to go away,â€ she says. â€œI think itâ€™s here to stay.â€ Obviously, we do too. * Unlike the Color Sensational Vivids and the Color Sensational Color Whispers youâ€™ve seen here over the past few days of Fashion Week, Maybelline New York Color Sensational High Shine Gloss is new(ish) but already in stores. 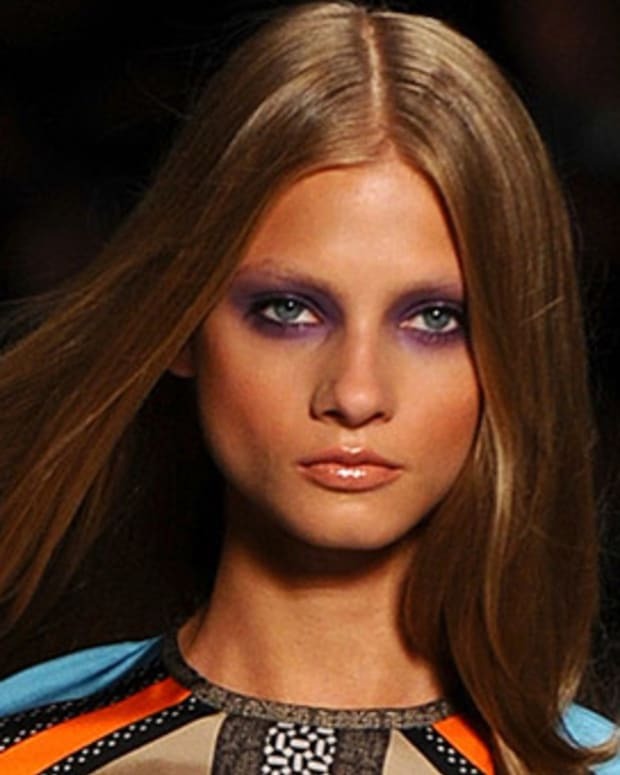 So you can go and replicate this look Right Now. No waiting until Spring.